What if I told you that you could be a smarter, sharper, better-looking, nicer version of yourself by doing nothing except crawling into bed? Of course you already know that solid sleep is key to next-day success. Maybe you’ve even learned that lesson the hard way like me. I once pulled an all-nighter to cram for a college exam, arrived in class and confidently plowed my way through all the questions only to fail the test because I was too tired to realize there were more questions on the back of the page! See? Even when you know all the answers, lack of sleep can make you stupid. Treating your body and mind to a restful night is the best way to ensure you look and feel good the next day (because I don’t need to tell you that no one looks good rocking under-eye circles). So what’s holding you back from getting a solid eight (okay, 6-8) hours? It could be one of these 6 culprits. Thankfully, once you know what’s getting in the way of your good night’s sleep, it’s easy to fix. Some sleep problems are easy to identify –– you know when you’re being kept up by an annoying noise or a too-bright room. But there are also a few less obvious factors that could be contributing to a night spent staring at the ceiling. What are they? As for noise, whether you’re bothered by sirens blocks away or your loud-mouthed family in the next room, block it out with some simple drugstore earplugs; they can work wonders and at a few bucks a pack, you’ve got nothing to lose. Not enough? Take the next step with a sound machine. My savior here in noisy NYC is a sound conditioner like the Dohm noise machine. It doesn’t make me feel like I’m in a frog-infested rainforest or terrify me with a crack of thunder in the middle of a rainstorm track. Instead, it manages to blend any outside noise into a calm and soothing whirring that makes me drowsy as soon as I flip it on each night. So you’ve got your noise and light issues sorted but you’re still awake? Answer me this: how’s your temperature? Cooler temps promote better sleep (and can even stimulate your metabolism but we’ll get that another time) so feel free to lower that thermostat. Greg Shugar, co-founder of men’s bedding startup Thread Experiment explains , “We know the age-old debate is that he likes it cool and she likes it warm. Well, guess what – this time, the guy is right. Studiessuggest that we sleep better in colder conditions. Not arctic temperatures, of course, but about 1-2 degrees cooler than your typical house temperature.” So what’s the cool-but-not-too-cold sweet spot? Research reported in Time Magazine says setting your thermostat to 65 provides the optimal sleep setting. Your senses make a difference – lighting, sound, and temperature will absolutely affect a good night’s sleep. Dim your lights leading up to bedtime until completely off, muffle noise with ear plugs or a trusty sound machine, and crank down your thermostat. Between work or school, family and your social life, you’re super busy. I get it. But don’t forget that your waking hours need to be grounded in good nighttime habits to keep you looking and feeling your best. You already know those late nights aren’t doing you any favors (although isn’t that sort of the point? ), but a few debaucherous, sleep-be-damned nights aren’t really such a big deal. The real roadblock to getting consistently good sleep is your overall erratic routine. If you’re up at 6am some mornings but make up for it by sleeping until noon on the weekends, you can’t exactly blame your body for not knowing how the heck it should feel half the time. Do yourself a favor and try to stick to a rough sleep schedule. Getting to bed and waking up at around the same time most days gets you into a groove that will pay off by helping you fall asleep faster and making it easier to wake up in the morning. An unreliable sleep schedule caused by an erratic routine will confuse your sleep cycle throughout the week. Find a rough schedule that works…and stick to it. Tough love time: if you’re crawling into a mattress on the floor, have bedsprings that squeal every time you roll over, or sleep in ANY situation involving superhero sheets, it’s time for an upgrade. Every man needs a comfortable mattress, a real bed frame and clean, stylish bedding. Because guys, let’s get real: if you want to at least look like you know what you’re doing when you get between the sheets, why wouldn’t you start with the actual, you know, sheets? It makes sense for modern men to take as much pride in their bedding as women traditionally have. Greg Shugar and Justin Mikita founded Thread Experiment on just that premise. “Sleep in a bed you want to be in,” says Shugar, “for comfort AND design. The more pride you feel in the way your bed looks (from the bed frame to your duvet design), the better you’ll feel in your bed. It’s not about spending a ton of cash you just don’t have. Opt for simple cotton sheets with a design you really like. If you really need a new down comforter, save up a little so you can splurge (and then care for it properly so it lasts). Or upgrade the items you already have with a few smart add-ons. Sleep expert Pardi turned us on to the innovative world of mattress toppers designed to revitalize – rather than replace — a mattress that’s not working for you anymore. This one from Airweave uses Japanese Technology to create a topper that’s breathable, soft, and evenly disperses body pressure. If your bedding basics are up to par, make room for a few new items to give your space more style. Think plaid woolen blankets or a couple of colorful throw pillows (they’re not all girly, ruffly poufs anymore). The happier your are in your bedroom, the better you’ll sleep. The better you sleep, the better you’ll do everything else in your life. A couple of easy upgrades might just drastically improve your luck in the bedroom and beyond. Sounds like a no brainer to me. Imagine how you want to feel in your room and let that feeling guide your design. In search of comfort? Try a cozy bedside rug to add another layer of texture and warm up your feet in the morning. Want more romance? Look at your lighting situation (hint: a dimmer switch works wonders. If you’re relying on an overhead light, stop. Stop today. Add some bedside lamps – or even better, sconces! – and never look back. If you still wake up feeling drained, consider what an external factors might be to blame – like too much late afternoon coffee or a potent nightcap. Psychology Today reports a recent study showing that ingesting caffeine (their subjects took a pill; you’re probably reaching for a double espresso) even as many as six hours before bedtime significantly reduced both the quantity and quality of the participant’s sleep. Sounds like that after-lunch latte gets a pass, but if it’s getting closer to evening, do yourself a favor and switch to decaf. Turns out, same goes for a drink. Even though alcohol may make you pass out fall asleep, it won’t be good quality sleep. Just like everything else you do while buzzed, you’re probably not doing it as well as you think you are. Sleep expert Pardi explains, “Alcohol is a depressant, so it can help you fall asleep, but when this depressant metabolizes out of your system, it can wake you up or can make your sleep lighter. This means that 8 hours of sleep might actually feel like you only got 5 hours. If you’re going to drink, and you really care to have a great day the next day, drink early, then stop. Alcohol burns off at a rate of about 1 standard drink per hour, so work backwards and aim to have all the alcohol out of your system by the time your head hits the pillow.” New rule: everyone to the bar by 7pm. Who’s with me? Ingesting caffeine or alcohol late afternoon to early evening will effect the quality (and quantity) of your sleeping hours – so be wary of your intake if you want to wake up refreshed. If mid-afternoon coffee or a post-dinner night cap is on your agenda, start early and stop early. Maybe you have all the right sleep ingredients assembled – your room is cool and quiet, you’re sticking to a set schedule, your bed would woo a Bond girl, and you’re carefully avoiding stimulants – but you just can’t turn off your whirring mind. Sound familiar? Decompressing is, of course, easier said than done, but the process really is an essential ingredient to a good night’s sleep. Just like your body needs to rest, your mind needs a nightly break, too. Worrying about what happened at work yesterday or your packed schedule tomorrow is not only not helpful, it’s actually hurtful. You’ll be at a significant disadvantage in that 9am morning meeting if you’re exhausted and chugging a venti cold brew just to get through the agenda. So how do you get rid of those thoughts when heading to bed (or at least put them on hold)? If you had a bad day and it’s bothering you, simply addressing it – instead of trying and failing to pretend nothing is wrong – can go a long way toward being able to let it go. If you’re the talky type, hash it outwith a friend or your partner. If you prefer action, think about ways you can prevent problems like that from arising next time. Or maybe you’re like me and you lie sleeplessly in bed making mental to-do lists. In Captain Obvious news, the moment I started actually writing those tasks down on a pad next to my bed was the night I was able to fall asleep without feeling like I had to hold all that information in my mind (turns out, that’s NOT relaxing). Finally, consider meditation. Practicing a calm yet focused task like mentally counting down or mindfully relaxing each muscle in order to clear your mind and relax your body can significantly help you settle down before your head hits the pillow. A simple meditation track could save you hours of tossing and turning and you can get one right on your phone. Try apps like Headspace(the 10 minutes a day for 10 days intro program is great for beginners) or Omvana with its vast selection of guided meditations (it will even recommend one based on your mood). They’re both completely free to download so you truly have nothing to lose. Making headspace is just as important as making a cozy sleeping environment because relaxing your mind from the day’s worries is integral to relaxing your body and dozing off into a great slumber. Say it with me…decompress. Talk it out, write it out, and meditate your way to a calm mental state. Perhaps the problem isn’t you at all. Maybe you’re sharing the sheets with an otherwise lovely bunkmate who turns into a kicking, clawing, snorting beast as soon as the lights go out (and not in a good way). Or is a drooling, furry friend the issue? The pets in bed debate rages on in bedrooms everywhere, but if your sleep is interrupted over and over, it’s time to reclaim your territory once and for all. Thread Experiment’s Shugar agrees with me. If your problem is more of the human variety, it gets a little more delicate. After all, you can’t exactly banish your misbehaving partner to cuddle a body pillow on the floor. If this is you, know that you’re not alone. Many couples have trouble co-existing through their REM cycles (25% even admit to sleeping separately), but there are lots of things you can do to get along better in bed. First, make sure you have enough space. If you need to invest in a bigger bed to sleep happy, do it.Don’t worry, mattress shopping isn’t the chore it used to be. The last few years have given us so many cool, innovative mattress companies – brands like Casper, Leesa and Tuft & Needle – who are not only giving the big brands a run for their money, but also helping the consumer take back control by lowering prices across the industry. It’s a great time to be in the market for a new mattress so take advantage; you’ll not only be prioritizing your sleep but also your relationship! If snoring is the problem, use some of your noise solutions (you already got those all set from above, right?) and do your best to realize your partner isn’t annoying you on purpose (even though it can certainly seem that way at 3am). After all, the best way to deal with sleep incompatibility is by working together, so show your partner as much patience as you can muster. Share you bed with care. If pets are taking over, it may be time to claim your own space. More of a partner problem? Invest in a bigger bed and recognize your sleeping preferences so you can adjust. Seize the consumer-friendly mattress industry! From a multitude of affordable, hi-tech bedding options, you and your partner can certainly find a size and type of mattress that’s conducive to both sleep preferences. Bruh, we know its a pain to remake your bed—but you have to wash those sheets. In America, more usually means better. Bigger portions, larger TVs, more horsepower! But when it comes to your bedsheets, it's best to toss this conservative thinking aside. When picking a new set to lie under for roughly a third of your life, understand that a higher count doesn't automatically mean better quality – and the magic number is right around 300. Thread count is actually the number of threads woven into one-square inch of fabric. This is different than "ply," which is how many threads are twisted together to form one piece of thread. A single ply fabric uses just one piece of thread, and a double ply twists two threads together into one. But here's the thing – the Federal Trade Commission permits bedding manufacturers to count the threads of two-ply fabrics twice. "This doesn't actually increase quality and it doesn't increase the feel. All it does is make it a heavier, less breathable fabric," says Greg Shugar, co-founder of Thread Experiment, a men's bedding brand. So a 600-thread count is not 600 threads woven together. It's just two-ply 300 thread count entwined. The sheets are artificially bulkier, and twisting threads together doesn't make fabric softer or more comfortable. 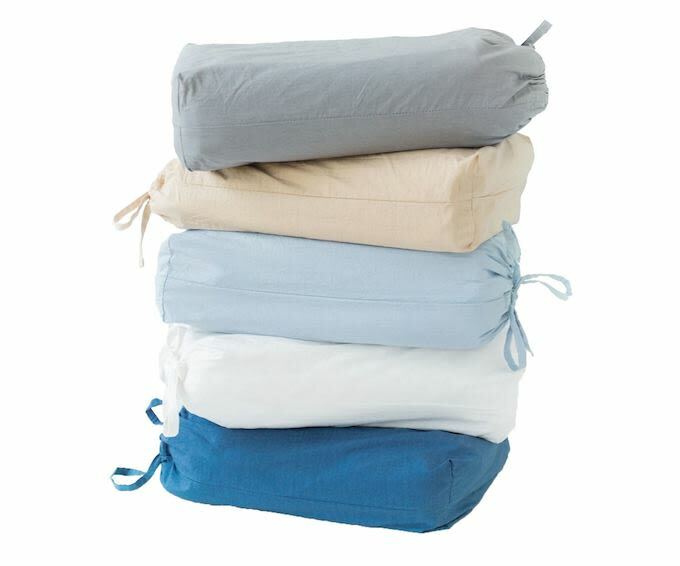 The same goes for a pricey 1800 thread count – really just four plys twisted together, which makes a thicker fabric. While thread count may not be much more than a marketing ploy, fiber and fabric quality are important. Stick with cotton or cotton-linen blends. The percale cotton washed solids from Thread Experiment are a good pick, and woven to stay crisp. Shugar urges to stay away from manmade polyester and microfiber, which won't last as long and feel less soft than cotton on your skin. "And god help you if you're into silk." As he roamed the Las Vegas trade show floors, Greg Shugar, founder of The Tie Bar, realized he’d discovered a gap in the market. “It dawned on me that there’s no bedding brand dedicated to men,” he recalls. Shugar teamed up with Justin Mikita and Greg Winner on Thread Experiment, a new company that markets bed sheets ($98 to $208), comforters ($168 to $218) and duvets ($158 to $198) to men. Here, we talk to Shugar about how they’re getting guys to care about their sheets. Men spend a lot of time on the way they look with grooming and clothes. We think the bedroom should be an extension of the way a man looks. With so many choices out there that are pink and turquoise with flowers and lace, it doesn’t give men many options. We launched the brand with an exclusive sale on Gilt and the results exceeded our expectations. The best part was that Gilt featured the brand in the men’s section rather than home, which confirms my belief that men are indeed seeking out bedding that appeals to them. The first collection is built around 100% cotton, 300 thread-count sheet sets with duvets, comforters and shams in masculine colors and patterns. If you’re reading the style section of this site, there’s a pretty good chance you care about how you put yourself together. You’ve thought about your style, evaluated your closet, and invested in the kind of wardrobe that says something about who you are as a person. There’s also a pretty good chance that your apartment, house, or other form of homestead (yurt?) doesn’t do that same job of reflecting your taste and personality. We’ve all been guilty of copping that grail piece instead of replacing that threadbare IKEA sofa. But unless you live like a hermit, you should consider the kind of statement your personal space is making when friends, family, and dates come over to hang out. Greg Shugar who launched men’s bedding company Thread Experiment with Justin Mikita and Greg Winner in May of this year (and also cofounded The Tie Bar), is definitely on board with the idea of investing in your sleeping space. He just doesn’t believe in over-investing in expensive, high-thread-count sheets. “We really stopped seeing a noticeable difference after a 300 thread count,” he says. As long as you’re using natural fibers like cotton or linen, you’ll be comfortable. Get yourself three sets of sheets—“one for the bed, one for the closet, and one for the wash”—and not only will you save yourself some serious hassle next time you need to do the laundry, you’ll be able to change up the look of your bedroom as you see fit. Shugar offers one last piece of advice for upgrading your personal space: “Start with cleaning your damn apartment.” Sounds reasonable to us. Menswear has been undergoing a massive diversification and expansion in the last few years, but as it grows some less-likely avenues are likely to escape notice. 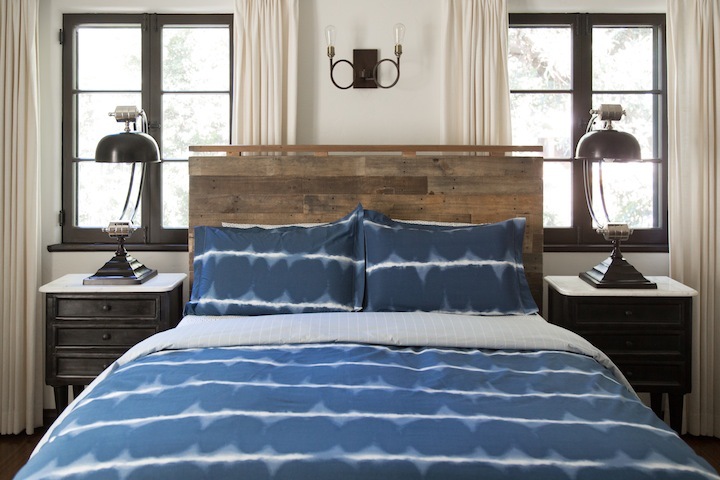 Lawyer and tastemaker Justin Mikita(who's also the husband of Modern Family's Jesse Tyler Ferguson), and Greg Shugar, founder and creator of The Tie Bar, saw one of these blank spaces in fashionable men’s bedding, and decided to fill it in with Thread Experiment. Thread Experiment also has a layer of social responsibility: With any purchase of a full bedding set, the company will donate a full set of bedding to a homeless shelter or a qualifying housing charity in need. Shop the inaugural collection here. Greg Shugar, who founded the online men’s accessories retailer The Tie Bar, and two partners have launched a new company that markets bed sheets, comforters and duvets to men. Thread Experiment, which Shugar created with Justin Mikita and Greg Winner, debuted this week with a sale on Gilt Groupe and a site launch at ThreadExperiment.com. Shugar, who’s handling marketing, branding and front-end e-commerce for Thread Experiment, says he came up with the idea for the company in 2013 while roaming the sourcing section of the Magic trade show in Las Vegas. “It dawned on me that there’s no bedding brand dedicated to men,” he says. He sees a sizable market for Thread Experiment, including single and divorced men, college students and gay men—and any other guy who doesn’t have a woman making the decision about sheets and comforters in his life. There’s also a charity angle—Thread Experiment will donate a bedding set to homeless shelters and other places in need (parts of Haiti and Nepal are recent examples cited by Shugar) for every full bedding set (sheets and duvet or comforter) sold. Mikita is Thread Experiment’s creative director, overseeing the design and look of the products. He and his husband, actor Jesse Tyler Ferguson, met Shugar when they teamed up with The Tie Bar on a collection of bow ties supporting marriage equality called Tie The Knot in 2012. Winner, a longtime friend of Shugar’s, heads up operations in the company’s Chicago headquarters. The first collection is built around 100% cotton, 300 thread count sheet sets with duvets, comforters and shams in masculine colors and patterns. Retail prices for sheets sets range from $98 to $208. Shams run from $28 to $45, duvet covers from $158 to $198 and comforters from $168 to $218. Sizes run from Twin through California King. Thread Experiment will launch a fall collection that includes linen/cotton blends, some textured woven cottons, duvet inserts and a design collaboration with menswear designer David Hart.